Mall directories provide information to shoppers. But at Calgary's Chinook Centre mall, shoppers are discovering that sometimes they collect information as well. 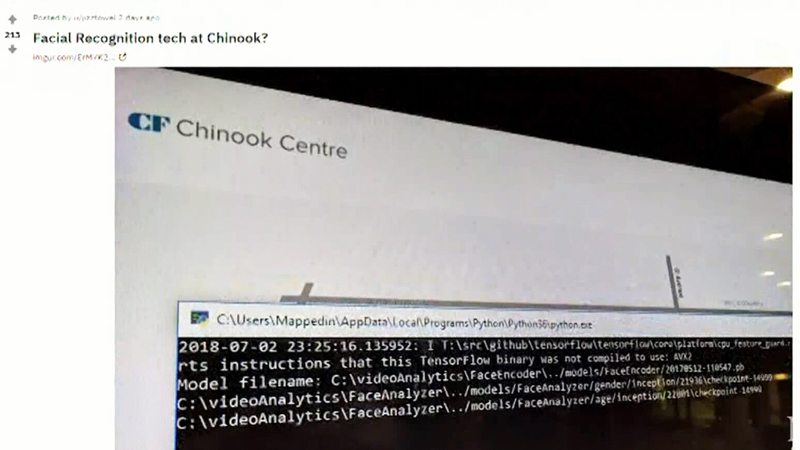 New information kiosks in Chinook Centre are equipped with unmarked cameras that are connected to facial recognition software, installed to monitor visitor demographics. The software was exposed after a user posted an image to social news aggregator Reddit of a browser window that appears to have been accidentally left open on one of the mall's digital directories. The photo shows a program loading files that include the phrases "videoanalytics\FaceAnalyzer\," "age/inception," and "gender/inception." Though facial recognition software is nothing new for law enforcement and airport applications, many shoppers were shocked to find that it made its way to retail. Representatives from Cadillac Fairview, Chinook Centre's parent company, declined CTV Calgary's request for an interview, but released a statement regarding the directories. "The cameras in our digital directories are there to provide traffic analysis to help us understand usage patterns and continuously create a better shopper experience," the statement reads. "These cameras do not record or store any photo or video content." They also say that as of June this year, they began testing software that attempts to predict the approximate age and gender of users, but again stressed that no video content is recorded or stored. They declined to disclose any other Cadillac Fairview locations where the program may be in place. Sharon Polsky of the Privacy and Access Council of Canada says that information collection of this sort has been going on for a long time, but few people realize it because companies don't put up proper notices. While Alberta's privacy commissioner says no complaints have been filed about the digital directories, they are monitoring the situation. A post from a Reddit user first brought attention to the facial recognition software running on the information kiosks.